Never before seen! A 37 week update! 27 Jan 2014 Comments Off on Never before seen! A 37 week update! Yay! Baby has reached full term. He likely measures around 18.9 to 20.9 inches and weighs about 6.2 to 9.2 pounds, and he’s gaining about a 1/2 ounce each day. During week 37, baby’s practicing some skills: inhaling, exhaling, sucking, gripping and blinking. He’s also getting his first sticky poop (called meconium) ready for his first diaper. Still 26 lbs ….I’m pretty much right on target, if not a little less, than I gained with Urijah. We’ll see how this one shakes out in the end, though…depending on how long I go. What I miss hasn’t changed from lat week….getting back to my normal self. But as of today I feel like I can look forward to this birth again. I was feeling so disappointed and nervous when I knew he was breech; about very likely having to go the hospital c-section route. I wasn’t feeling very comfortable with the idea of a breech natural delivery, even though my midwives would have supported it and done it. I was lamenting the fact that my midwife wouldn’t deliver this baby like she had Urijah, and that I would have to stay in the hospital for some time rather than getting to go home soon after birth, and that this baby wouldn’t be born in the same place, and same room, as his big brother. I was feeling pretty depressed and stressed about it all…especially knowing that this baby was inside my body and yet, I still couldn’t make him do what I wanted. Frustrating! Now, I know there is no guarantee that he will stay in the head down position, but it’s likely, so I’m going to stick with that and try to stay positive. Can’t hurt, right? And I’m going to go to one more chiropractor appointment since getting adjusted will help my pelvis open up a bit more and help the baby settle down in there. Not much change here….we didn’t get to go look at cars since that day we actually had a small ice “storm” that wasn’t exactly the best weather to go out in. U stayed home from school and so we did, too. Other than that, we’re ready! I think the obvious highlight is the non-breech status we learned of today. Another highlight has been all the movement from this kiddo. He has been very active the past few days, and especially at night when we sit down to watch TV or a movie after U is in bed, he goes crazy! My whole belly moves and jumps and it is so surreal to watch. We could even see, what looked like a foot, dragging its way down the far side of my belly a couple times – that was strange. I need to get some video of it…hopefully tonight he’ll do it again and I can catch it. Also, I guess another highlight is that we have officially surpassed the length of time I was pregnant with Urijah. My water broke at 36w1d and I had him on 36w6d. 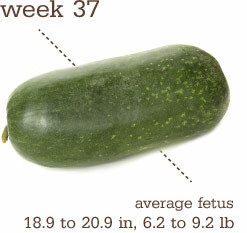 As of today, I am 37w, so yay! Heather told me today, that since he is head down now, and is officially considered “full-term” at 37w, I can go anytime with no issues! I’ll update again after the fact. Check back soon!